Quiltville's Quips & Snips!! : Vintage Quilts, New Braunfels Style! Irene sure knows how to get a yes out of me! We’d been sewing for hours – I am making great strides of progress on my litle on point 4 patch units. ((Still, a gazillion and fifty more are needed, so just keep sewing, just keep sewing!)) She thought we needed a break, and along with some errands, we found ourselves a couple of hours to wander the antique malls in nearby New Braunfels. I have NEVER seen so many great vintage quilts in one small town! The majority of what we saw hailed from the 1930s-1950s. Some a bit older. Some a bit newer. But it just goes to show you that quilting was alive and well in Texas during the lean years. Three with black chevrons, all in a row! 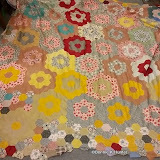 What I love about vintage scrap quilts: Their total lack of randomness! While we fuss and fight making sure no two same pieces end up too close or heaven forbid – even NEXT to each other ((Horrors!)) These quilters just ended up putting them wherever they put them. Often times grouping “like kinds” together. This top was a bit too brittle to be thinking of – and especially after dealing the near vintage fabric fiasco of the past couple of days – was great for a photo op, but not great for thinking I could turn it into a completed quilt. Hexagons are everywhere. And this quilt was crisp, clean, very well done, and $500.00! I guess prices are on the rise in New Braunfels as well – –great photo op, though! Holy fabulous Log cabin, Quilt Girl! Close up. 1940s, perhaps a bit earlier! I just love the dark dark fabrics against those pastels used as lights! How about THIS sashed spider web? This one was just a top, smelled pretty gnarly, and was nearly crunchy with some staining. I think I’ll just opt for photos, thank you! But what a fun variety of fabrics, and some ingenuity in putting it together! Each Large block is 12 X 12 –144 pieces! And this was just a drop in the bucket. There were so many quilts that I can’t put them all in one long blog post, so I’m uploading them into a slide show that you can watch. There is a pause button on the slide show, so if there is something you want to study a bit more, hit pause! Or if you prefer to see them in a static format, or if you are unable to view the slide show on your mobile device, click the image below. You’ll be taken to the photo album for viewing. We came home SO inspired to get back sewing! This morning we are out the door early – I’ve got a Texas Tumbleweeds workshop with the Greater San Antonio Quilters! I’m looking forward to spending the next couple of days with these folks and getting to know them one on one! It’s Friday! Whoowhooo! Make it a good one! Hi Bonnie, question for you. You take hundreds of pictures. I'm assuming on your cell phone. How do you manage them? Do you delete them once home? Do you save them onto a computer? Do you organize them, and how? I too take so many pictures, a lot of them are for inspiration, but just don't know how to manage them. Any suggestions? Thanks, Charlene in AZ. You hit the jackpot on finding quilts today, What a wonderful quilt show thanks. I can't stop drooling!! What a wonderful slide show! Thanks! I think today's post is the best single collection of vintage quilts you have ever done! Most of the quilts look like like they came from the "school of Bonnie" thank-you for sharing. I bet it was helpful and fun to have a partner to spot & hold for you. Well Done! Love the block with the blue and pink plaids going every which way. I can relate! It made me happy! Beautiful selection of vintage quilts! I think I need to go see my baby brother who just transferred there. I have a new Great nephew in the NICU unit,main hospital there,he was born in Nov. weighing just 15 ounces(now 3.9lbs}. Didn't realize it was such a quilting mecca. Thanks for taking us along on your trip. What an amazing collection of gorgeous quilts! I especially like the pink & white of 1/2 square triangles - sew unique :-) and the one with a green tree with a big red/yellow flower in the middle. I would have had a hard time leaving without one of them! Thanks for sharing! that's the most inspiring bunch of quilts i've ever seen. OMG they were beautiful. and so much pink, which i love. thanks for sharing them. Loved the slideshow! Yes, Texas is full of great antique malls and lots of quilts. Hope to visit there in summer!have a great weekend! Wow! That's a lot of beautiful quilts! So many of them remind me of your quilts, Bonnie, I absolutely love your quilts because they are traditional and scrappy and are meant to be used, just like the old quilts. Thanks for the show and taking the time to take the pictures, edit and post! You are so giving of your time! Enjoy yourself! Oh one more thing...I miss your commentary on each of the quilts...you always have so much insight, the slide show just isn't the same. But that would take you forever! Thanks for what you do give us! Wow - lots to see. I think this qualifies as SPEED BROWSING. Beautiful quilts, thank you for sharing. Would love to know the stories behind each creation. That is quite a lot of beautiful quilts you found all in one place. I can't believe you didn't come home with at least one of them! Wow!! What a feast for the eyes!! Thank you for showing us such a terrific array of lovely vintage quilts!! I really enjoy your descriptions and analysis of the many quilts and sewing machines that you happen to come across during your travels!